Other ingredients: microcrystalline cellulose, stearic acid, magnesium stearate, modified cellulose gum, and colloidal silicon dioxide. Suitable for vegetarians. Suggested Use: For athletes, 1 tablet 30 to 45 minutes before and after workouts. On non-workout days, take 1 tablet with breakfast. For dietary enhancement, 1 to 2 tablets daily with meals. Ferulic acid (FA) is a constituent of the seeds and leaves of many plants, particularly in grains. FA concentrations vary widely depending on plant variety and growing conditions. FA is water-soluble and is well absorbed when used as a supplement. Its structural resemblance to curcumin (a poorly absorbed supplement) suggests its possible value as a curcumin substitute. 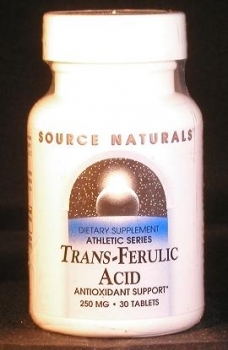 Ferulic acid’s value as an athletic performance enhancer is controversial, two studies support it, one does not.